1987 - A group of Tuscarora School District residents and educators formed the Tuscarora Wildlife Education Project (TWEP). With the support the president of the World Peace Foundation and the senior partner of Rhoads and Sinon, TWEP was formed as a nonprofit charitable foundation. 1987-1999 - The founding group approached the Tuscarora School District for space to begin the project. TWEP was given a classroom at JBHS. The Project acquired the trophy collection of Claire Winter. Charles Brightbill, a teacher in the Tuscarora School District and an environmentalist at Cowan’s Gap State Park, worked as the director of the TWEP classroom until his death in 1994. Over 19,000 people visited the original classroom/museum in the high school. 1990 - Barb Peshkin, JBHS art teacher, began the TWEP Art Show. 1990 - Claire Winter's collection was donated to TWEP. 1991 - TWEP began raising money to build an environmental center by holding an annual auction/banquet. 1992 - A summer program was developed for students in the Tuscarora School District. Each summer over 100 students participate in this program which includes instruction in stream analysis, forestry, wetland restoration, plant and animal identification and field trips to study local environmental programs and areas. 1992 - The TWEP Board approached the TSD School Board with a proposal to build a Center on the JBHS campus. 1992 - TWEP held its first banquet/auction fundraiser. Jack Hubley, host of Call of the Outdoors, served as Master of Ceremonies for the event. Ed Weibley volunteered as TWEP's auctioneer and magician Russ Smith provided entertainment. 1993 - Pam Ebersole volunteered as TWEP's director. 1994 -1995 - Alva Lynch helped catalog over 600 books that were donated, as well as a video library which was developed for teachers and citizens of the community to borrow. 1996 - Chip Baker, JBHS Biology teacher, began a new course - High School Field Biology, setting 40% of the class time to be spent outdoors and using the TWEP grounds. 1997 - TWEP acquired a 99 year lease of a section of land between the James Buchanan Middle and High Schools. Jason Shindle, local architect, presented TWEP with the final building plans for the Center. The Tuscarora School Board approved the building plans for the Charles T. Brightbill Environmental Center, which was constructed on the leased land. An extensive African collection of Simon Rhoads was incorporated into the museum, shortly after its completion. 1997 - Elizabeth McClintick began work as TWEP's first paid director. 1999 - TWEP had raised over $200,000 and began construction of the environmental center. 2000 - The construction was completed. 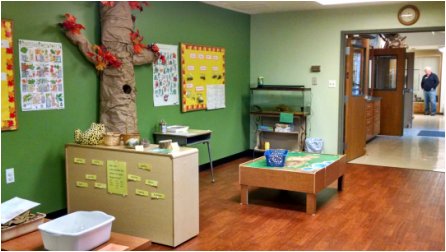 The environmental center is located next to James Buchanan High School and contains a classroom/laboratory, museum, numerous displays and collections, a petting zoo, and a board/conference room. 2000 - Liz McClintick, as TWEP Director, actively began designing a schedule for TSD schools to visit once a year in coordination with the swimming schedule. 2015 - Construction on an addition to the Center began. The size of the facility doubled which allowed for more display and instructional space. The facility now sits on about 16 acres with mowed walking trails, an outdoor classroom, and a pavilion. Today - TWEP continues to gather resources to share with the community while planning a bright future!